Up until now, Chrome's Web Apps have been trapped in your browser, living with the rest of your internet like glorified tabs. Well, Google's putting an end to that today. A new breed of Chrome Apps is here, and they live on your desktop. Like old-school Chrome Apps, these new ones can sync between devices, and hook into Chrome's new rich notification center. But unlike old-school apps, they exist in their own windows, launch right from the desktop. And most importantly, they work offline. You know, like real apps. So far the selection is pretty limited, with only one official Google service app to speak of: Google Keep. But it's in good company with apps like Pixlr Touchup for photo editing, Pocket for reading, and freakin' Spelunky (Spelunky!!) for game-playin'. 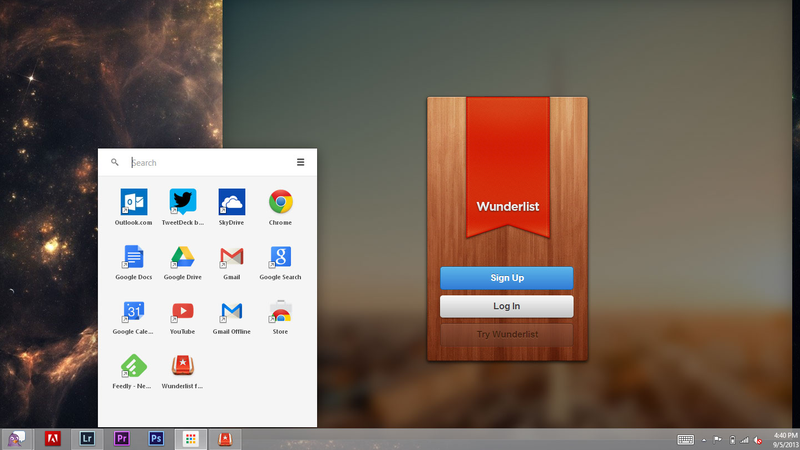 And Google's even bringing out the App launcher from Chrome OS for you to keep them all organized. This is all only on Windows and Chrome OS so far, but it's headed for Mac and Linux soon. There's nothing new about Google Chrome powering apps with some pretty serious functionality. After all, how else would you be able to get anything done on a Chromebook? But if those apps can sneak out of the browser window and live on their own, man. They're suddenly a lot more valuable. They stop feeling like some sort of half-crippled web software. They stop being some sort of half-crippled web software.